Can anyone help me ID this plant. I’ve reviewed our plant reference books and don't think it’s native to our area (pacific northwest BC Canada). It is growing on the side of the highway so it may have germinated from something thrown out the window . If given better soil I think it would grow into a tree rather than a shrub. The branching is alternate, it has no thorns, leaves are about 3-4cm long and it also has the same colour (red\purple) under the outer bark. Hello Gman. 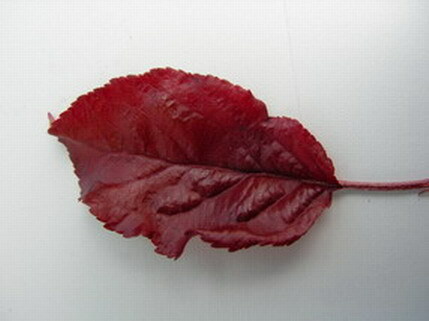 The leaf looks like a Cherry or Crab Apple. Can you get a better shot of the trunk and bark? Re: Help with Tree ID. Gman - I think that Will is right. It sure looks like a crab apple to me. If so it’s very nice! 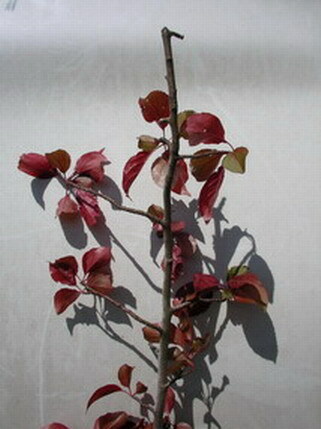 There are a number of varieties that have red-purple leaves in the spring that turn to green in summer. 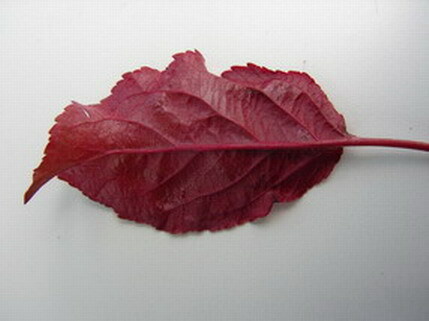 One such cultivar is Malus “Strawberry Parfait.” If this is collectable it seems like choice material. It’s hard to imagine that one of the carefully developed cultivars of crab apple is growing as a ruderal along the highway, but stranger things have happened. Looks a lot like an escaped purple plum (Prunus cisifera) or purple leaf sandcherry (prunus x cistena) both of which are pretty common landscape plants here in the east. Nice bark and beautiful foliage but unfortunately pest prone and short lived. Worth experimenting with though. Its located along a busy highway and not growing in the "best environment" so the leaves may not be showing their true shape. 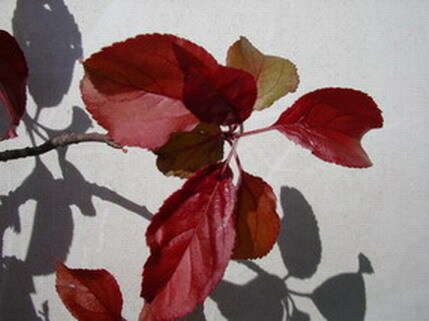 We do have a local crab apple but their leaves aren't that colour this time of year. We also have a lot of the ornamental purple plums around the community. I'll watch it over the summer and compare some samples with those in town. Another recent find has been a decent local yew (the pacific yew), almost falling off the cutbank of a logging road, that had been recently "opened up" (snow removal), the yew has been growing for sometime leaning out to the light and being browsed by local deer and Elk. I hope to collect it soon and look forward to hearing your suggestions on a future semi cascade. Look forward to the Yew Gman, sounds interesting and I've not seen one before.